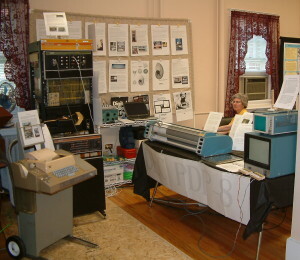 The retro computer hobbyist group MARCH hosted the Vintage Computer Festival East 2008 exhibit. I brought a PDP-8/I Computer with 8k core, along with AX08 laboratory peripheral, DF32 Fixed head disk drive, PC01 High speed paper tape reader/punch, ASR-33 Teletype, Tektronix 611 and 603A storage tube monitor, Calcomp 563 incremental plotter, and PT08 serial port, and VT320 terminal for my exhibit. The PDP-8/I was the third model of PDP-8 computers. I also brought a DECmate III which was the last of the PDP-8 line of computers. I was showing how the AX08 could capture a signal from a signal generator or a microphone, display it on the Tektronix monitor, and plot it on the plotter. I also installed the extended arithmetic element (EAE) for the 8/I so I could run spacewar this year. To install the EAE 8 wires needed to be removed from the backplane and 25 cards installed. See the pictures below. Since the machine has no particular provenance and installing options yourself was done when machines were new I decided that removing the backplane wires was ok. I try not to make changes which can't be reversed to the machines. Spacewar needs a monitor which settles faster than the 70us of the 611 so I used the 603A for it. The 603A CRT is bad so it doesn't work well as a storage monitor but worked fine as a normal monitor. I also had games people could play using the teletype. Using the PDP-8/I internal serial port and the PT08 with the VT320 terminal I could also run multi user basic (Edusystem 20). Things went pretty well this year from the failure standpoint. I only had to replace a transistor that drove one of the front panel bulbs shortly before leaving. The VT105 terminal when I turned it on only displayed a line across the middle of the screen. A whack on the side got a full display but it was jittery so I brought the VT320. The Tektronix 611 monitor also failed in the last 10 minutes of the show.